Parquet Courts are a four piece from Brooklyn, New York and possibly the most American band you’ll have heard in a while. Most notably compared to early Pavement, circa ‘Slanted and Enchanted’, they encapsulate just about everything about New York’s musical heritage; repetitive chords from Ramones, spoken word rants from the early eighties ‘No Wave’ scene, and all done with the swagger and confidence that’s impossibly Iggy Pop. They’re aware of their musical pedigree, and my god they’re going to use it. Opener ‘Master of My Craft’ is a simple three and a half minute pop ditty, with spoken lyrics over aggressive surf guitar. This has Pavement written all over it. Without so much as a breath second track ‘Borrowed Time’ kicks in like it’s part of the same track. The only difference being that the vocals have switched from Andrew Savage (guitar and band leader) to Austin Brown. They tend to swap vocals and backup vocals throughout the record. From the outset you can hear that this is no nonsense stuff, and even between the tracks no time is wasted to get another one in front of you. The record calms down for ‘Yr No Stoner’, with its math rock plucking and repetition. The thing most noticeable about Light Up Gold is how different their tunes are. They go from stoner rock to all out aural assault with a seconds notice. More ranting on ‘Yonder Is Closer to the Heart’, and it’s relentless. The lyrics come so thick and fast that’s difficult to hear what’s going on. It’s awesome. You can hear the passion and urgency in the vocals in the track, as it’s rattled out like it’s the last thing they’ll ever do. The slightly dirty production on this record adds to its charm. This isn’t a polished record, and nor should it be. ‘Careers in Combat’ is political statement on the on-going conflict in Iraq. It’s actually odd to hear bands talking about politics these days, and it shows Parquet Courts aren’t afraid to talk about what they want. I’m guessing they’re of the age where they have friends involved. Title track ‘Light Up Gold’ (featured as Parts I and II) is rattled out in what feels like a few seconds. It’s fast, it’s furious, and if I’m honest I have no idea what they’re singing about. It just sounds great and they mean every word of it. 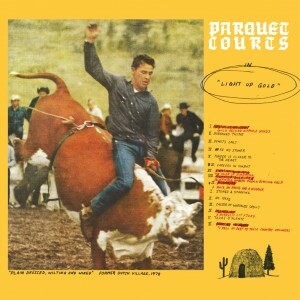 The passion and commitment to their sound is what’s consistently impressive with Parquet Courts. All of it is slightly off kilter, but there isn’t an ounce of fear in their approach. ‘Stoned and Starving’ is the obvious single, and most people would take this away as the track of the album. ‘I was walking through Ridgewood, Queens, and I was flipping through magazines’ croons Savage, name checking a trending Williamsburg-neighbouring town. It’s good to hear a band celebrating where they’re from, and the area that gives them inspiration. Brooklyn is red hot currently, in terms of the bands and shows happening there. This is easily the most accessible track on the album, and I’m sure how most people will discover them. ‘Caster of Worthless Spells’ is pure Sonic Youth circa EVOL in 1986. It’s Lo-fi and grandiose with deep guitars and sullen vocals. I have no clue what they are singing about but their conviction is undeniable. ‘Disney P.T.’ is another quick piece of Iggy/Ramones-inspired destruction. ‘I want your disease!’ screams Brown, like a true punk icon. Closing tracks ‘Tears O Plenty’ and ‘Picture of Health’ slow things down for the end of the record. ‘Light Up Gold’ is schizophrenic throughout, and it’s loud/quiet/fast/slow approach keeps you listening for more. It never settles into anything you would expect. It’s a record that can’t really make its mind up on what it is, but is so bursting with idea and things to say it doesn’t care. Parquet Courts are a completely unexpected breath of fresh air. At a time where most bands and labels are geared toward tried and tested sounds and trends, and focused on shifting units, here is a band who don’t give a damn. They make music for themselves, they take risks and they’re all the more interesting for it. As with all good punk their attitude and passion can sometimes get the better of their ability, but that is the very essence of the movement they encapsulate so completely. The ranting, the stoner rock, the stop-start changes all make for probably one of the best and most interesting records of the year so far. This entry was posted in Parquet Courts and tagged Light Up Gold, Mom+Pop, Parquet Courts, Whats Your Rupture by admin. Bookmark the permalink.